" A good book on your shelf is a friend that turns its back on you and remains a friend." I love reading; it's my escape from reality and I can step in between the pages, forget about my problems and instead face the problems of the characters in what I'm reading and just get lost in the maze of words. Books amaze me through the fact a different life is just a page turn away and how you can almost become that character in the book. Also, how the idea of a book is so simple, but the complexity of its content and the amount of thought that must go into it really does baffle me. The way you manage to connect with the characters on such a personal level and dive deep into their lives feels like such a privilege. Yes, it is fiction but there is so much truth in any story line that would happen in our lives such as betrayal and romance. 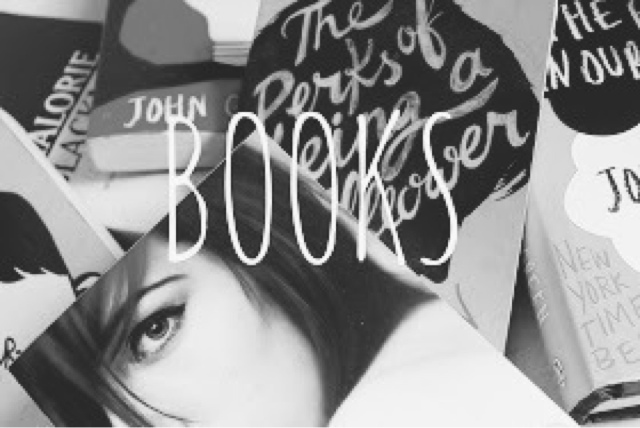 The best types of books are the ones you can relate to on such a personal level in one way or another. The relations may not be direct but, either way, show a connection with you and at least one of the characters in the book you read. Many people will use the line "I read to help me sleep" or "I read before I go to sleep" which makes many 'non-readers' think that this means you are reading a book because it is boring so helps you sleep because you are bored. Yes, books do help you sleep but books are far from boring. I find that the concept of reading before bed helps you to sleep because, I find, books are a nice,calming end to a day full of stress at school or work. I find that also the fact that you are calm when reading - and also because you're keeping your brain working tires you out- and so naturally (obviously) you start to feel sleepy. One thing I take into account is where I read and When. There is no point reading in a place where you know you will be easily distracted because you will never get the full benefit of such an amazing book; that book you may be reading may be the most amazing book in existence and you wouldn't know that if you were being distracted. I tend to read on my way to and returning from school on the bus. If I am going on a fairly long journey by car or train, I will be sure to pack a book or two bearing in mind that reading too much when travelling can normally cause people to feel sick and I don't want you to get sick of reading (yes, that pun was intended)! I will always make sure to take a few books when I am going on holiday or a school trip for the journeys but also for the days out; say you finish eating dinner quickly or your bored of playing that same family board game your family have played every night since you arrived for entertainment, you can take out a book, sit and read. I tend to read most during holidays, as there are no worries of school work and so I can follow the book precisely. If I was giving you one piece of advice on how to read more, it would be to make sure you have a book with you at all times because you will never know when an opportunity will arise to read a page or two. Why not take your book outside when it's sunny with a nice cold lime and soda? 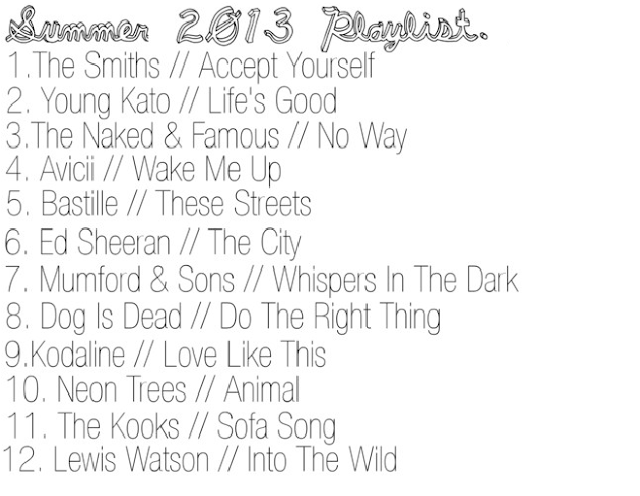 It is personal preference if you like to listen to music while reading but, for me, I love to and I even have a reading playlist; this is actually going to to be my next playlist post that I will make sure to leave the link for here when it's done (smooth plug Sarah,smooth). The memories and events mentioned in my books are somewhat fonder memories than some of my own; in a few years, I won't remember what I did yesterday: 25-7-2013 and that I spent the day writing this blog post while watching old James Bond films, but I will remember the story lines of the books I've read many years before yesterday and for many years to come. I can't force anyone to love reading as it's personal choice,again.However, just like there is someone, a soul mate, out there for everyone; there is at least one book out there for everyone to love and cherish for the rest of their lives. In the near future, I will be doing some reviews, including book reviews of many different books of different genres It may be, from those, you find a book that takes your fancy which will take you on a new adventure of a love for books. I'm a massive fan of music; I'm one of those people who feels slightly uncomfortable when there is no music on (I hope I'm not alone with that). So, I thought I'd put my love of music to good use and post playlists maybe once a week for a certain mood and I will try and turn this into a sort of series. 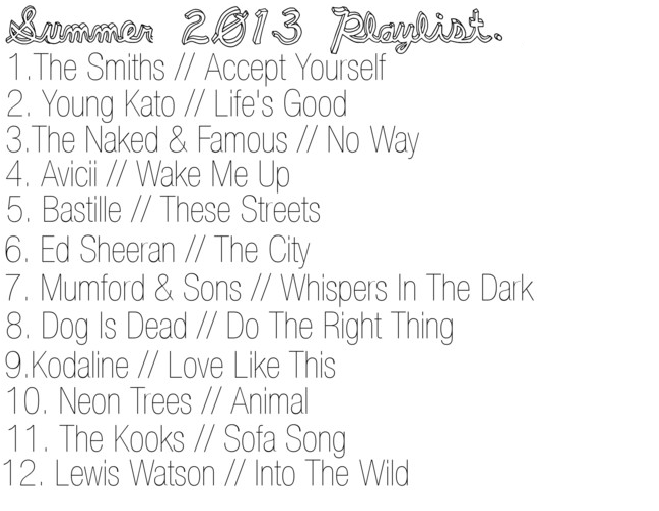 I will make sure I include a range of different music types to try and please as many of you and maybe introduce you to new artists or singers so my first one is going to be very obvious seeing as we are in summer summer so my debut playlist is a "Summer 2013 Playlist"
So Here is the 1st installment, I hope you enjoy and feel free to let me know what you think and what songs you're listening to a lot this summer! Last night, I was doing the stereotypical movie stare out the bedroom window. As stupid as I may have looked to my neighbors, me stood there gazing at nothing but the night sky, it was weirdly calming and helpful in making me think through things properly. One of those was change and how summer last year when I broke up from school is so very different to this time around. Last year I had the same group of friends which I stuck to like glue until I realised that it may be for the better if i peel away that glue and just be my own who can be friends with whoever and even make new friends in other people. Mot all the changes I made this year were my choice as they have been just a natural occurrence or the change that effected me was in the hands of another person such as a friend or a family member; but some changes were my own such as last school year i made my own decision in what GCSEs i will be taking. Some changes have been big such as the loss of family and friends but others are just small one such as my music taste- the music i listened to last summer is not the same as it was this year. This time last year I was wanting to make a blog and now I have and it's a reality and it's just great! Up until this year my future has been as to what path I want to take after school where as now the are so many options that I really can't decide. The one thing, above all, that I love about he changes I make is the fact that this time last year I didn't get along with some people and most of them I now class as close friends and that to me is the most positive change that has happened to me this past year. There are so many meanings to change and how many changes ave occurred daily in this past school year that i could go on forever but I think change is something that is happening just now as you read this or i type this and it is very hard to document every little change. Change really does scare me for instance ! don't want people to tell me I've changed and then hate the 'new me' but sometimes change is something you can't control and I have to come to terms with the fact change is something good most of the time and it will always happen everyday and so I have o learn to love change and once that happens I won't be scared as to what to future holds anymore. I see people doing the "50 things that make me happy" so I thought I'd mix it up a bit and name this "Happiness in the Alphabet". I will simply write something that makes me happy for each letter of the alphabet; some may have more than one if a lot of things make me smile so here we go! Some letters were harder than others and it sort of ended up listing things that I like not just what makes me happy. Aside from that, I really enjoyed making this list and I would love to see your versions so if you do decide to make your own, leave the link to yours in the comments below and i will be sure to add your to this post so others can have a look at what things make you happy! When I decide to cook or bake there needs to be hazard signs surrounding the kitchen so it's on a very rare occasion that I decide to make myself tea. However recently I have been wanting to explore new recipes in my all new regime of trying to be healthy; to not get that 'summer body' but to try and myself feel happier in my skin.This is fairly hard for me because of how much of a fussy eater I am and so when I stumbled upon this recipe I was definitely ready to try it. When I went on a weird rampage in downloading many free food apps, I downloaded the 'BeFoodSmart' app run by the organisation 'Change 4 Life'. The recipes on this app were limited but some were just taking a meal that mostly kids would love and putting a slight healthy twist onto it. While scrolling through their recipes for dinner times I found one entitled 'Jollof Rice'. This dish is just plain white rice in a sort of tomato sauce. The instructions on the app were slightly vague and confusing so I'm now, below, going to tell you how I made it myself. On the app it also gave ingredients for a quantity of 8 adults so i modified to suit half of that. In a food processer or liquidiser, place to onion, pepper and liquidise. Once finished, tip into a large pan, cover and cook on a medium to high temperature for roughly 7 minutes. Next, add the tomato puree, bay leaf, crushed garlic, curry powder and thyme and leave to simmer for a further 2 minutes stirring occasionally. Now, add the stock and bring to the boil. Once boiled add the rice grains, turn down the heat, cover and leave to simmer over a low heat for 15-20 minutes or until the rice is tender. If there is not enough liquid feel free to add water to stop the rice from burning. When I feel the rice is finished I leave it to simmer and some chicken- this is the healthiest way to have chicken as it basically drains away the fat. Once the chicken is cooked I plate up with a portion of the rice the chicken and some baby leaf style salad and I now enjoy my meal! I do hope you try this recipe yourself and enjoy!